NOTE: This section changes frequently. Please check back often. Search for your Big Find: We are working as fast as possible yet hundreds of items must be photographed. Please e-mail your request  we may have just what you are looking for! Acceptable payment: Money Order or PayPal. Contact hope@thebigfind.com for additional information. 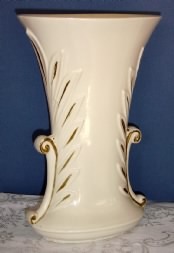 This is a large Abingdon vase. 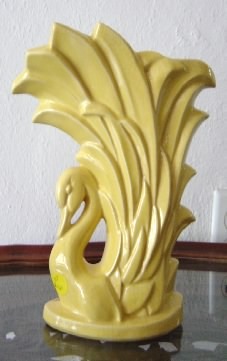 Ivory in color, it is in excellent vintage condition. It has a leaf pattern with scroll sides. Measurements are 11 inches by 7 inches across the top. $65.00 USD. 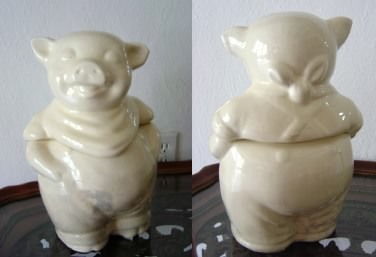 Large very old piggy cookie jar. Approximately 12 inches high, 9 inches across at widest. Vintage condition, grey spot on front. Unpriced.